After graduating High School I worked in advertising for four years, becoming an art director in a department store creating ads for newspapers. I worked for Ben Shahn at the CIO Political Action Committee (PAC) during 1946. Spent a year at Highlander Folk School in 1947. Worked with Ben Shahn again in 1948 at the Progressive Party when Henry Wallace ran for President. I was at the Yale School of Architecture starting in 1950. Received a B'Arch. in 1955. Worked in large architectural firms from 1955 until 1963 in New Haven and Stamford, CT. Opened my own architectural design firm in 1965. Raised five children, worked at home and completed over 250 projects to date. Painting and drawing since I was a child and have not stopped. Specialties:Home design and renovation . Portraits, still life and abstract painting. Charcoal drawings, both right and left handed. 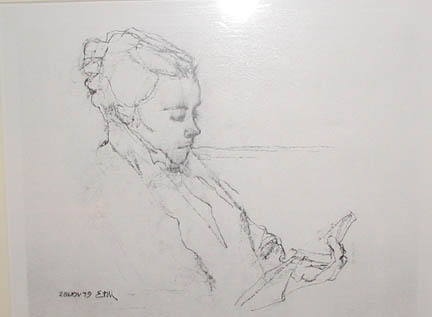 Margolis, Estelle Thompson, “Woman Reading [called "Figure 28, Nov 29" in McManus Room captions] ,” Westport Public Schools Digital Collections, accessed April 24, 2019, https://collections.westportps.org/items/show/1074.